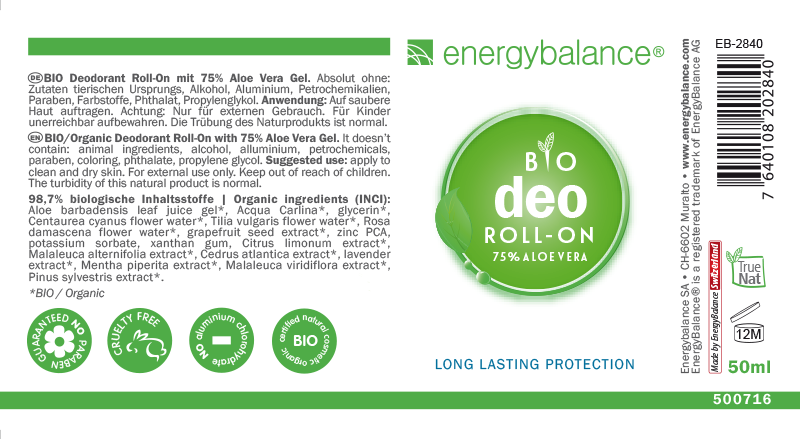 Organic roll-on deodorant with 98.7% organic ingredients. With 75% mild organic aloe vera that soothes the skin. This roll-on deodorant by EnergyBalance™ is natural, hypoallergenic and DOES NOT CONTAIN ANY aluminum, alcohol, artificial colors, paraben, petrochemicals, phthalics, propylenglycol or animal products. With the gentle fragrance. The special formula with natural minerals and organic aloe vera is a mild, soothing antibacterial product, producing amazing results even in the most sensitive areas. This organic deodorant slows the production of bacteria and prevents build-up of unpleasant odors. It won't stain your clothes or leave residue on your skin. Contents: 50ml. We wanted to develop an absolutely natural product with as many biological ingredients as possible, but one that did not contain potassium crystal. Crystal deodorants by EnergyBalance™ contain potassium crystal, also referred to as alum. Alum is a natural crystal made up of the hydrated double sulfate salt compound of potassium and potassium aluminum sulfate. That means that alum contains a natural aluminum sulfate compound, which, however, is not harmful like aluminum chloride. Aluminum chloride helps prevent sweating, penetrates the pores of the skin and contracts, deforms them or denaturizes the pores of the skin. In contrast, crystal alum stays on the surface of the skin and is anti-bacterial without penetrating the skin. Because of controversial discussions about deodorants containing alum, EnergyBalance decided to make an organic deodorant that does not contain crystal alum. This deodorant is made from 98.7% organic ingredients and contains 75% organic aloe vera. This organic deodorant by EnergyBalance™ slows the production of bacteria and prevents build-up of unpleasant odors. It lets the skin breath and perspire naturally. The deodorant by EnergyBalance™ is a natural anti-bacterial product, perfect for all types of skin, even sensitive skin. 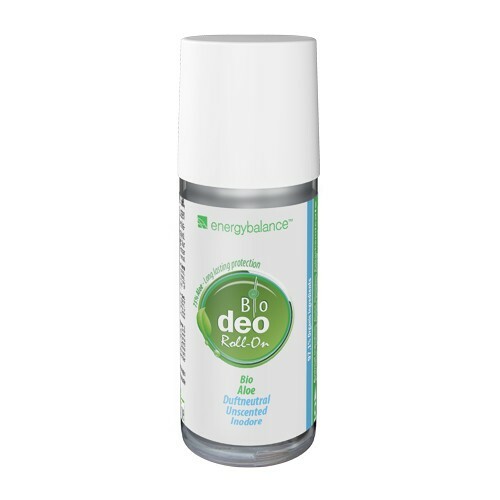 The EnergyBalance™ organic roll-on deodorant provides effective protection against unpleasant odors throughout the day. And it won't stain your clothes or leave residue on the skin. 98,7% organic ingredients: Aloe Barbadensis Leaf Juice Gel*, Acqua Carlina*, Glycerin*, Centaurea Cyanus Flower Water*, Tilia Vulgaris Flower Water*, Rosa Damascena Flower Water*, Grapefruit Seed Extract*, zinc PCA, potassium sorbate, xanthan gum, Citrus limonum extract*, Melaleuca alternifolia exctract*, Cedrus Atlantica Extract*, lavender Extract*, Mentha piperita Extract*, Melaleuca Viridiflora Extract*, Pinus Sylvestris Extract*. Hypoallergenic and DOES NOT CONTAIN ANY animal products, alcohol, aluminum, petrochemicals, paraben, artificial colors, phthalics or propylenglycol. Caution: For external use only. Keep out of reach of children.